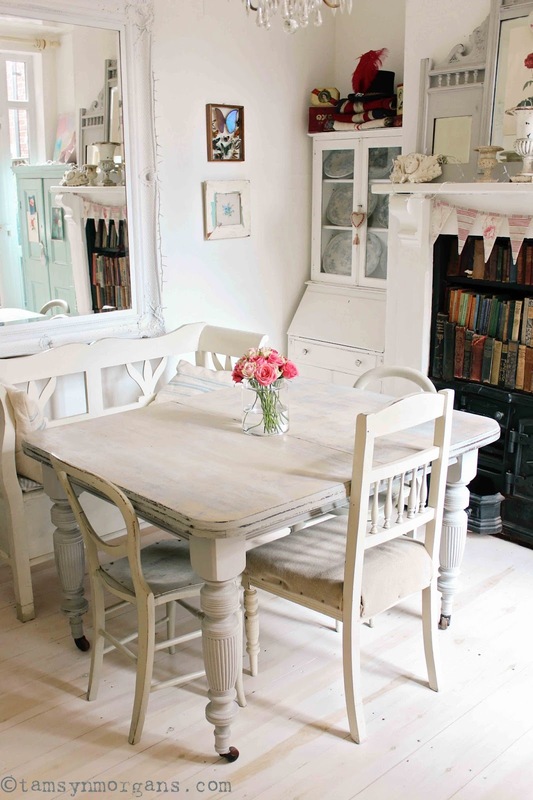 My farmhouse dining table, whilst it sat beautifully at my old house, never quite sat right in my dining room here. First of all, this is not a farmhouse. Not only that, but the proportions were not quite right – it was too long, and very high. There was something a little cold about it. I’ve been looking at it for a long time thinking a smaller, more square shaped table would fit this room better. After all, apart from when I’m entertaining, it is sometimes me on my own, and generally with two youngsters sat round a ridiculously huge table. So on Friday I went to my local Vintage emporium (Loose’s in Norwich), a two storey building bordering on warehouse proportions which is full of antiques, collectables and house clearance vintage furniture. I know they would have one of these old tables with beautiful turned legs, and I was right, they had three. This one has a lovely wooden handled crank, which fits in the end of the table so it can be wound round and round, so that the table splits and an extra leaf fits in so I can seat eight. 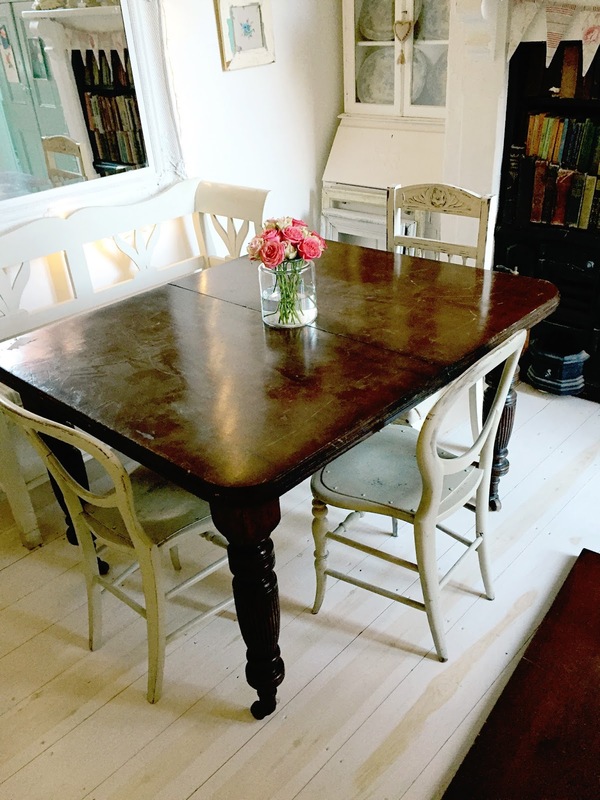 After a little haggling with one of the dealers there who I know after years of treasure hunting, I got this table for £150 and free delivery. Two hours later it was sat in my dining room, and my mission was to get it ready so that the children could eat their supper at it at 6pm that evening. It’s still not quite finished as you can see in some of the pictures, but my mission was accomplished. 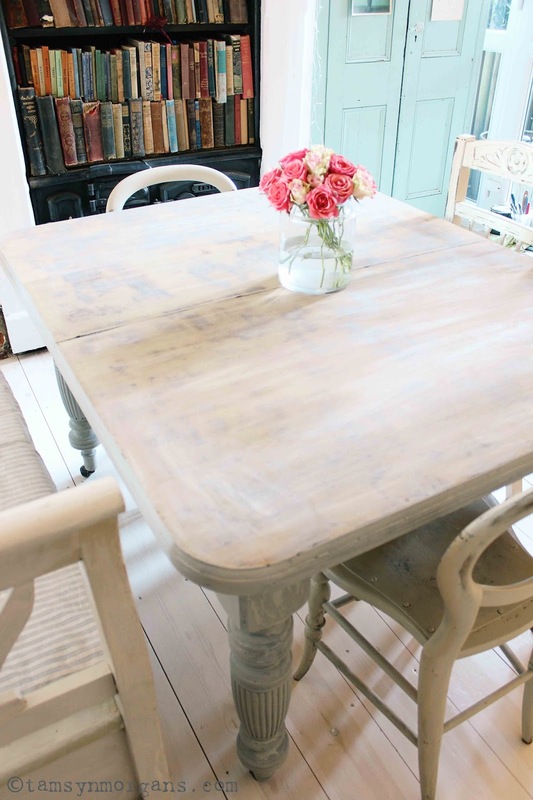 I sanded the top and whitewashed it, for a weathered, rustic look. I used chalk paint for the legs and sides, which I am gradually painting over with eggshell paint in French Grey by Little Greene. I love it, it looks like it was always meant to be in here. I’ll share some snaps when I get the leaf finished so you can see it in it’s full glory! I just love the look of your table, it has a calmness about it which fits in perfectly with your home. 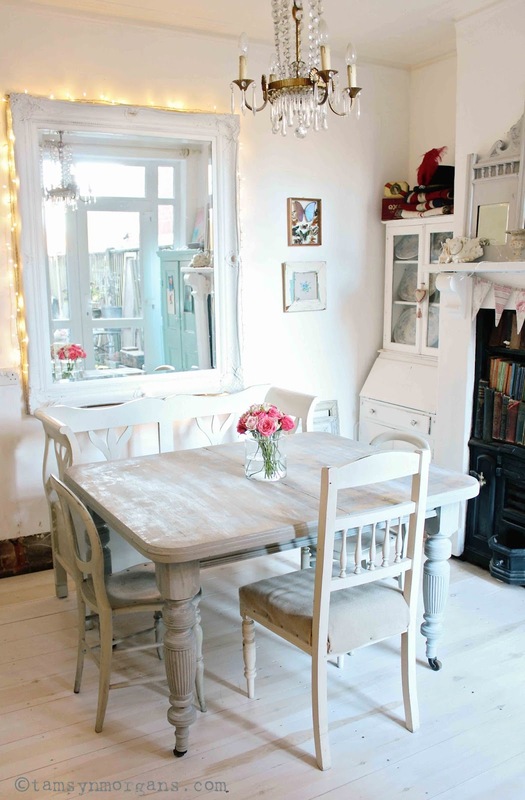 I am planning to do a similar treatment with my kitchen table and I hope it turns out as nice as yours. *clapping hands! I love it! And the new blog looks fabulous too!